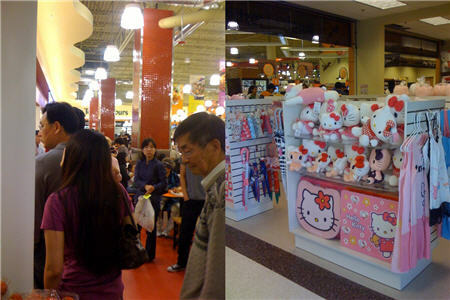 I just got back from the craziness that is the opening week of the new H Mart in Burlington, MA. It was instructive on several levels, not least of which was the personal (note to self: wait three weeks after the opening of a new highly hyped destination before attempting to visit). But there were also some business lessons in capacity planning to learn. I was curious about the supermarket’s general offerings — always happy to find a new place to get specialty vegetables like galangal and lime leaves, and the prospect of picking up a carryout pint of kimchee fills me with something like culinary concupiscence (Korean takeout being thin on the ground in the northwest Boston burbs). But this visit, at noon on Monday, was about the other big letters on the sign out front: Food Court. Takeout options are thin on the ground in this part of Burlington, with only a handful of places (Ginger Pad, Fresh City) within walking distance of my office, and only one or two more (Panera) within a reasonable drive. So I was excited that a new prospect was available. And I wasn’t the only one. When I parked (and the amount of time it took to do that should have been a warning flag) and got inside, I saw the big food court, about six counters in all covering various Asian cuisines, packed full of people. I parked myself in the line at the end for Korean food and waited. There were some real operations problems happening behind the counter. The wait time to place the order was about twenty minutes, and when I got to the counter I found that about half the selections were marked as unavailable (“No pork,” the harried cashier explained). Average order fulfillment start to finish was on the order of thirty minutes or more, with about ten of that cooking time. The rest was consumed with waiting for someone to pack the order and get it out, a problem exacerbated by un-bussed trays and dishes, only two visible line cooks, and short supplies. H Mart had, famously, months to get ready for the launch. How’d they goof it up? Chalk part of it up to opening week snafus, perhaps. But easy things like staffing the counters should have been solved problems by four days into the process. I think the real operational lesson is that H Mart neglected to anticipate all the potential sources of demand for its offerings. They didn’t have visible staff problems or lines elsewhere in the supermarket, and even had fully staffed demonstration tables nearby. What they didn’t count on was a large number of office workers eager for a new lunch option. That left-field demand spike apparently swamped their available capacity of workers and their foodstocks. The general lesson? When doing capacity planning, consider all the possible uses of your service and think day by day and hour by hour how they will be consumed. Then ask: am I ready? Well you know, a short trip down to Newport Snooze will take care of the shortage of Korean food :-). Hmmmm…there used to be a Korean restaurant near the movie theater in Harvard Square. It was a good spot, if it still exists. I cannot remember the name of another place I liked, but I recall stumbling into this hole in the wall Korean restaurant one wintery afternoon in Boston that had an amazing dol sot bibimbap. If I can remember it, I’ll send you a note. I wish my memory was better these days, but it’s full of PTA meetings and client details and appointments. Ugh!